Latin America two thousand and…1, 2, 3, 14.
and the biggest tongue on the planet! Welcome to MTV Music Awards Latin America two thousand and…1, 2, 3, 14. 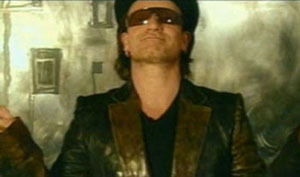 A video [12MB] is available to download at U2Arg.com (as a ZIP). MTV US will be airing the award show on October 30 at 11:00 pm ET and October 31 at 10:00 pm ET.